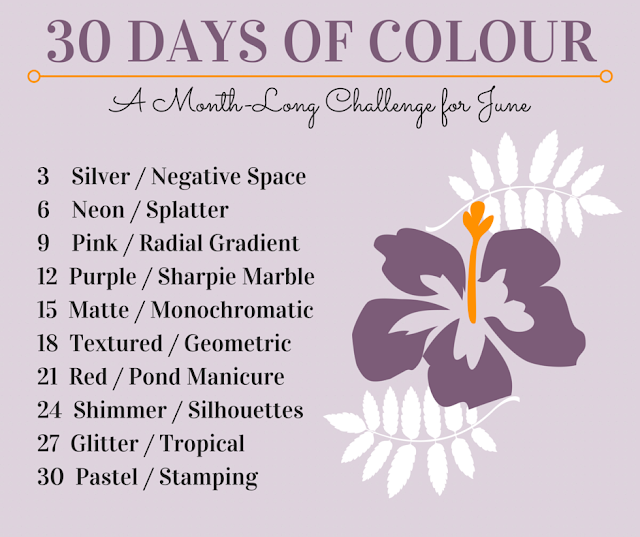 It's June, and we've decided to do another round of the 30 Days of Colour Challenge! The ladies came up with some awesome prompts this time around and I'm hoping I can be more active with them! The sharpie marble and radial gradient are already on my radar! If you haven't participated before, this is a really chill and fun challenge with lots of ways to participate. Want to just do swatches? No problem - the first column is for you! Want to do nail art? Awesome - can't wait to see what you do with the second column! Want to challenge yourself and combine both prompts for a given day? Go for it! - Challenge starts June 1st and everyone is welcome to participate! All link-ups are open until the end of the month so it's okay if you need to play catch-up! And as with all nail challenges it's always the more the merrier, so if you are interested in taking part please do! And stop by the Facebook group to say hello!